Looking for parts for John Deere toys? As we all know, toys need parts and maintenance just like everything else. 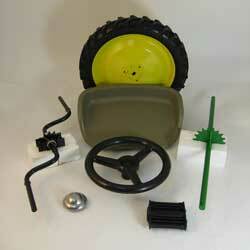 For parts and accessories for John Deere toys, GreenPartStore welcomes you to visit our sister site, GreenFunStore. We have parts for all the John Deere toys organized in an easy-to-find manner, so your child can get back to their imaginary farm ASAP!